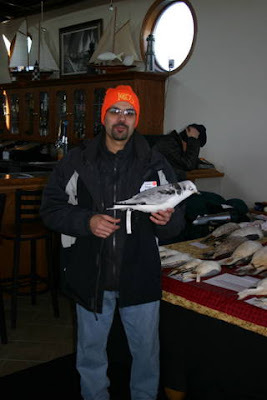 The Illinois Ornithological Society held its 11th annual Gull Frolic on Saturday, February 18th. As usual, the turn out was great with over 170 participants - extraordinary birders and extraordinary people. I had the good pleasure of presenting at this year's event which was truly an honor. This event always fills up pretty fast and registration is limited due to building capacity and fire codes. 7 Thayer's Gulls (3 adults, 1 4th cycle, 1 3rd cycle, 1 2nd cycle, 1 first cycle - a real "royal flush"). First cycle Black-legged Kittiwake. Chicago, IL. 31 March 2011. It's good to know the specimen was retrieved and prepared by the museum for educational purposes.